Today we are excited to release our first update from our Development Branch to Windows Insiders on the Slow ring since we released Windows 10 Anniversary Update. Below is a list of all the updates from the Development Branch that are now available on the Slow ring in build 14931. The Windows 10 Insider Preview ISO’s (advanced ISO’S), SDK, ADK, WDK, HLK, and Windows 10 Insider Preview for IOT will also be made available to all Windows Insiders today. 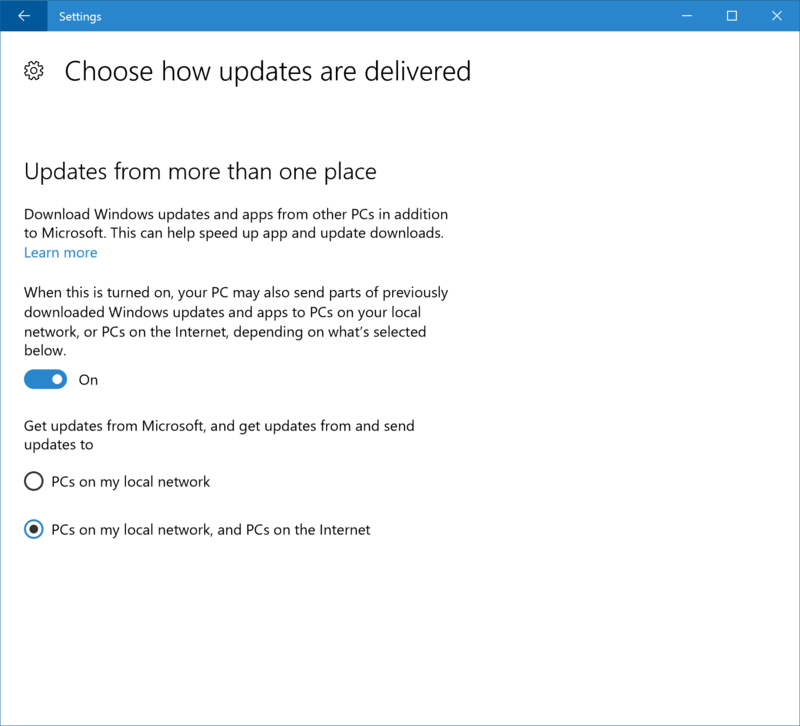 What’s new in Build 14391? 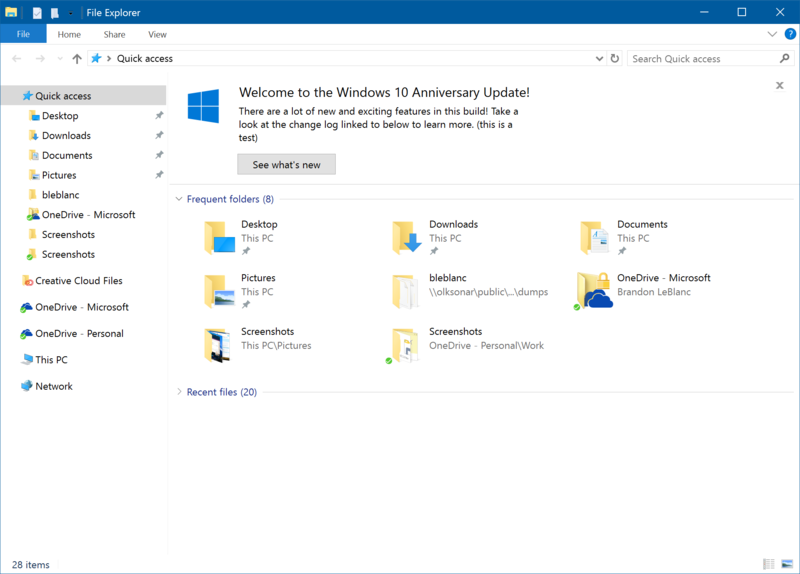 As part of an effort to explore new ways of educating our customers on features in Windows 10 – we are testing out new notifications within File Explorer. They’re designed to help customers by providing quick, easy information about things they can do or new features they can try to have a better experience with Windows 10. If you want to opt out of these notifications, you can do so by unchecking ‘Show sync provider notifications’ from the Options menu in the File Explorer View tab. Feedback Hub has been updated to version 1.1608.2441.0. This update contains some highly requested features from Windows Insiders including dark mode, showing the original feedback author in the feedback details, and a settings page for Feedback Hub. To enable dark mode, just go into settings in Feedback Hub. 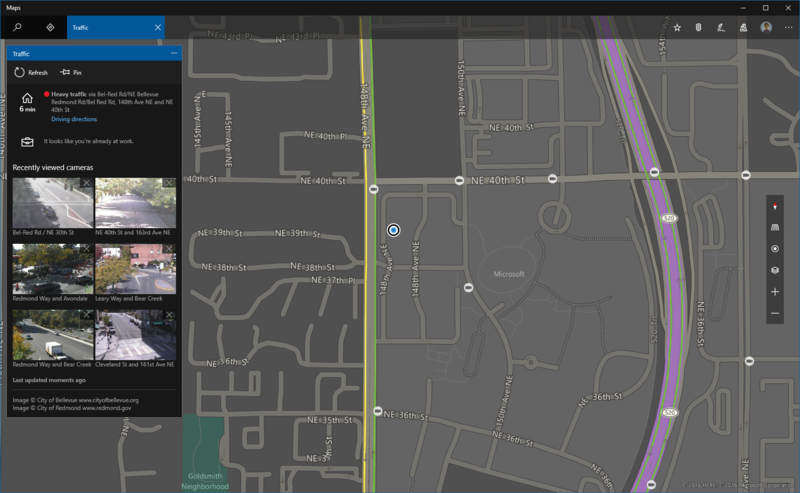 The Maps app was updated to version 5.1609.2580.0+ last week. You can now you can check the traffic to your Home or Work locations at any time by tapping the Traffic icon in the app bar. You will see traffic conditions to Home and Work and your most recently viewed traffic cameras so that you can stay on top of the road conditions along your route. Additionally, the Maps app now follows your system setting for theme preference for light or dark mode. And you can choose to change the map theme too! You can now try out sending and receiving SMS and MMS messages directly from a Windows 10 PC when Skype on their Windows 10 Mobile phone is set as the default messaging app. Give it a try and let us know what you think. For more details, see this blog post from the Skype Team. We now have native support for USB Audio 2.0 devices with an inbox class driver! This is an early version of the driver that does not have all features enabled, for e.g. : only playback (render) is supported with this version. Recording (capture) support is scheduled to arrive in later iterations. We encourage you to play with the driver and let us know what you think (using the Feedback app). If you already have third party drivers for your USB Audio 2.0 device installed, follow instructions in this blog post to switch to using the inbox class driver. We’re working with partners on adding new extensions and want our Insiders to try them out first! We have another new release which we need your help testing and giving feedback on before we publish to the general public: Turn Off the Lights is a lightweight and useful add-in designed for a more comfortable video experience. We also need some more help testing our other preview extensions: Tampermonkey is a popular userscript manager that lets users customize the content of pages across the web. Microsoft Personal Shopping Assistant is your smart shopping cart across the web, which collects your browsed products and lets you get price alerts for saved products and compare products between sellers. You can install this at the links above and try them out on any Anniversary Update build – send feedback to the Feedback Hub or @MSEdgeDev on Twitter.